Following the fire, both sites saw a marked increase in the presence of non-native invasive plants. 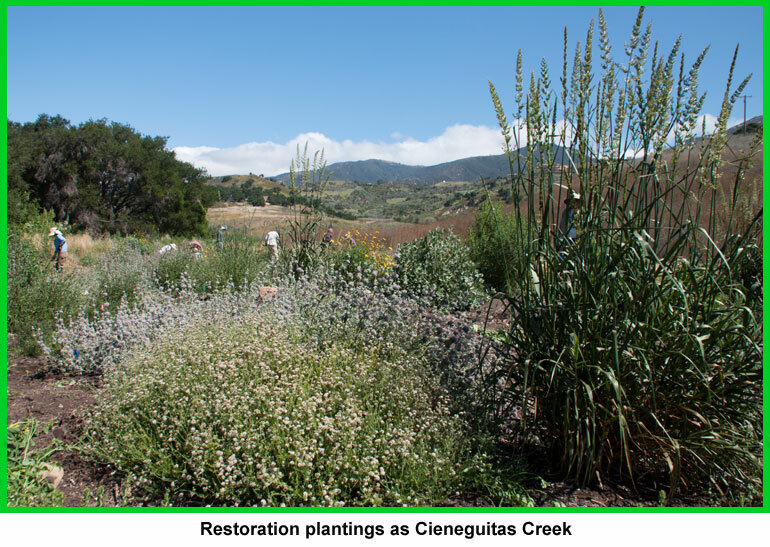 CIR started by removing invasive plant species with the help of hundreds of volunteers, and and this was followed by the planting of more than 4,700 native plants grown from locally collected seed. 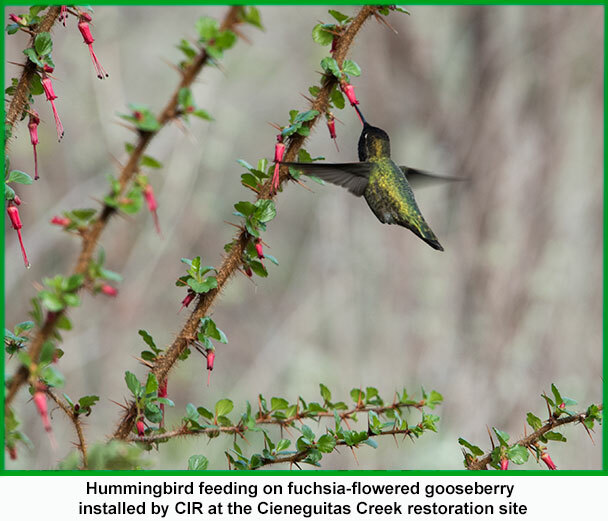 In addition to the creekside projects, CIR has been removing invasive plants along trails, particularly in native grassland areas and wetlands. We have also planted natives at the Preserves' Via Gaitero entrance. 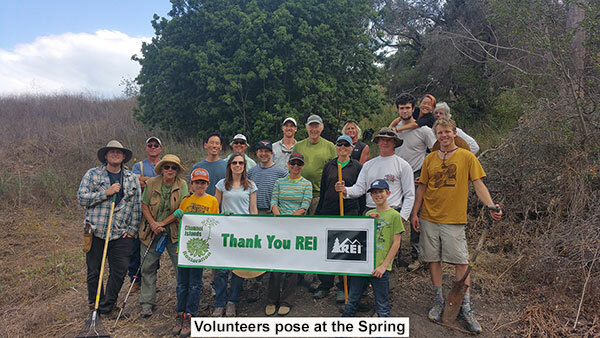 As of this writing (August 2015) CIR has worked with a total 1,319 volunteers on the San Marcos Foothills Preserve! 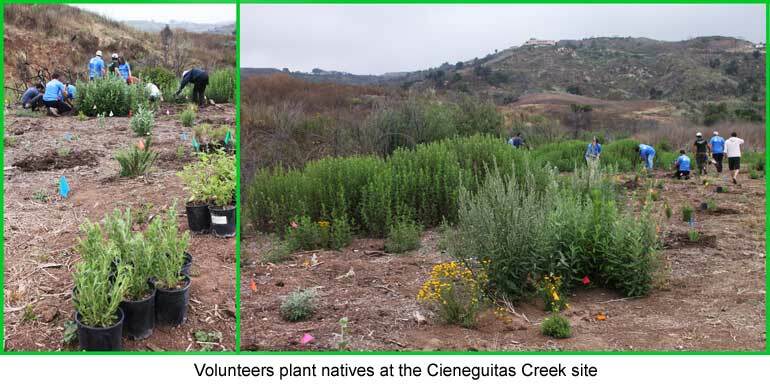 CIR staff and volunteers installed a total of 2,875 native plants at the site beginning in 2011. Since the initial plant installation, we planted more natives (mostly grasses) and have removed weeds from the site every year through 2015. Funding for this project was provided by the Goleta Valley Land Trust and by the San Marcos Foothills Coalition. Scroll down to see before and after photos of the site, plus a list of the native plants there were installed. 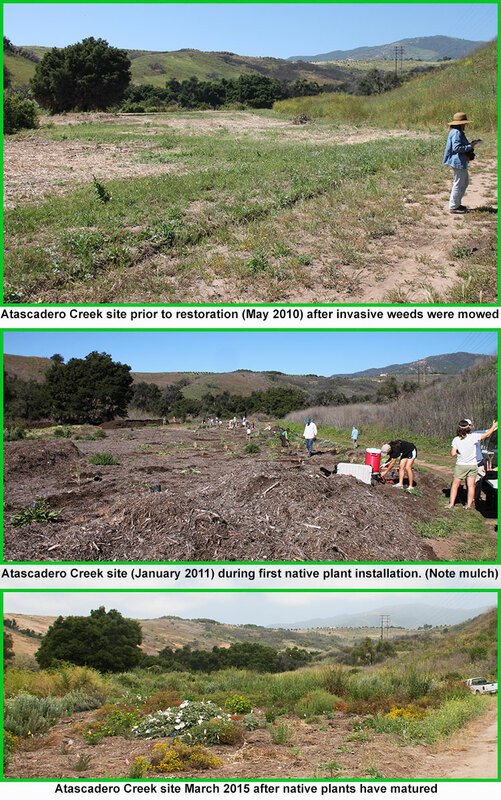 CIR staff and volunteers installed a total of 1,760 native plants at the site beginning in 2011. Since the initial planting, we have removed weeds from the site every year through 2015. 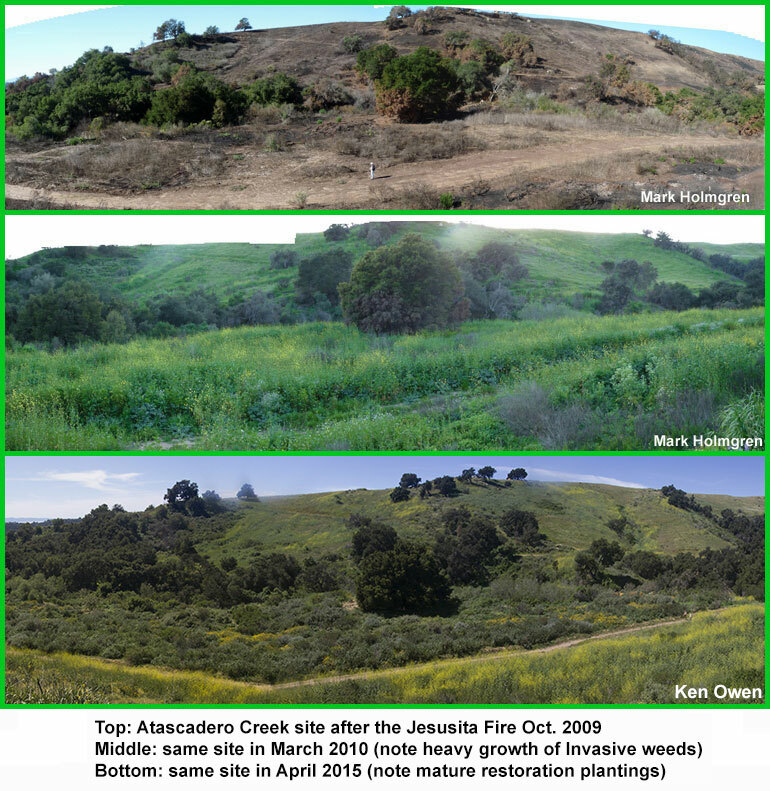 Funding for this project was provided by the Goleta Valley Land Trust and by the San Marcos Foothills Coalition. Scroll down to see before and after photos of the site and for a list of plants that were installed. Several native wetland plants such as spikerush, umbrella sedge and California rose grow at this natural spring near the Antone Road entrance to the Preserve. 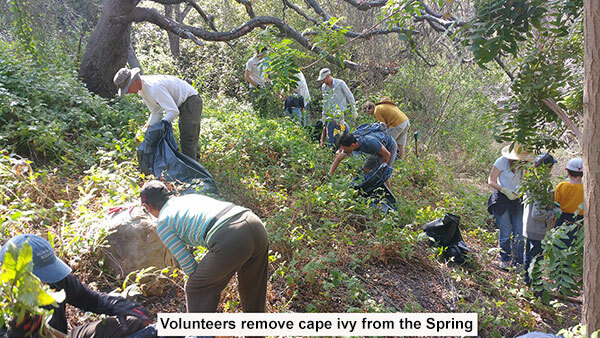 Because the area is wet year around, several invasive plants also grow at the Spring, including cape ivy, a particularly invasive non-native plant. Because the Spring is a natural wetland and may be a site for a future, larger restoration project, removal of invasive plants in this area is a priority. Two native grassland areas and an oak woodland benefited from non-native weed removal during this project. These areas included extensive native purple needed grass, blue-eyed grass and coast live oaks where we removed scattered weeds such as mustard, fennel and thistle. 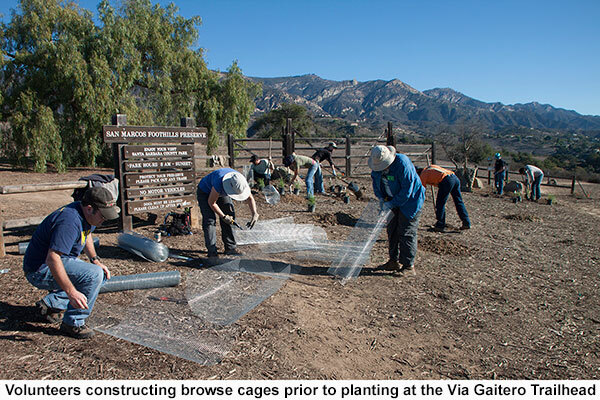 A total of 137 plants were installed at the Via Gaitero trailhead during initial installation and follow up replanting. 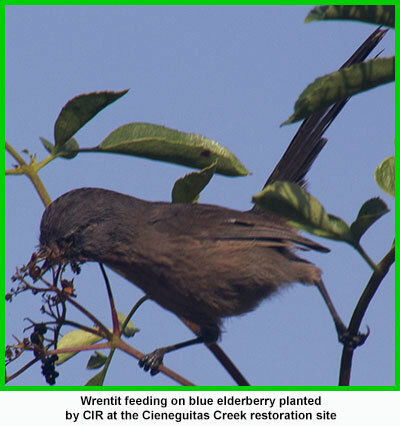 Extensive browsing from pocket gophers, brush rabbits and deer caused many of the plants to die. Subsequent re-planting included above and below ground browse cages that improved the survival of the replacement plants. 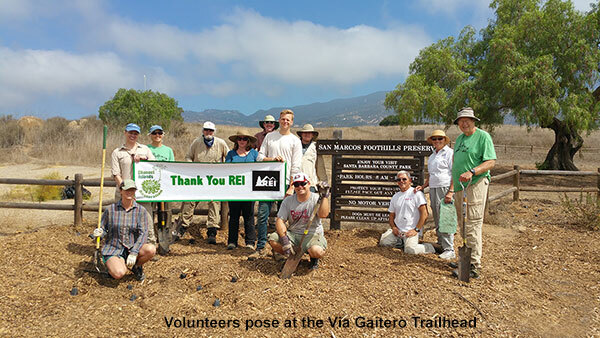 Funding for this project was provided by REI, the Ventura Patagonia store and the San Marcos Foothills Coalition. 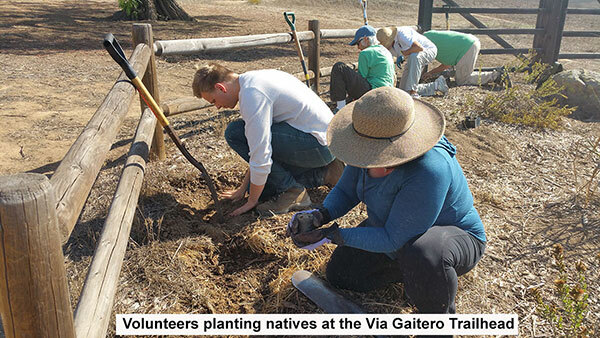 Scroll down to see photos of staff and volunteers performing this work and for a list of plants installed at the Via Gaitero trailhead.